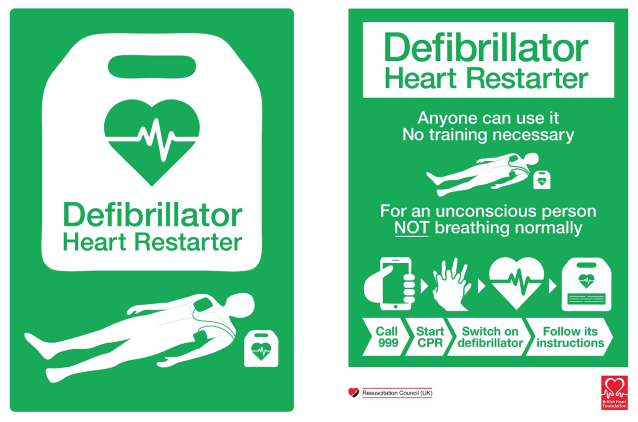 A VIDEO reconstructing how a man was saved by a heart-starting defibrillator will be used to encourage more organisations to install the life-saving machines. Ian Hough features in the video, called Pulled Through, produced by drp Video for West Midlands Ambulance Service. The film shows what happened to him when he suffered a cardiac arrest. Mr Hough is a rower but his heart stopped during a regatta at Stourport Boat Club on August 13, 2011. The club had no defibrillator but luckily there was medical cover on site for the event and the medics leapt into action, using their own machine to re-start his heart in the vital few minutes before paramedics arrived. Mr Hough, 59, made a full recovery and continues to row – but he says without the defibrillator he firmly believes he would not have lived to see his daughter or granddaughter again. He said: “I was dead for seven minutes. “Had this happened on a normal day I would be dead. Stourport Boat Club has since installed a machine, as have a number of organisations across the country, including many in Stafford, Stone and Rugeley. The public access defibrillators provide instructions on what to do in an emergency and can save lives. Ambulance bosses hope the video will encourage even more organisations to do the same. New research presented at this year’s Euroanaesthesia shows that use of public access defibrillation on people suffering cardiac arrest is associated with a large increase in chances of survival. However, despite the great potential, publicly accessible Automated External Defibrillators (AEDs) are not being used enough, concludes research by Dr Marianne Agerskov and colleagues at Rigshospitalet, University of Copenhagen, Denmark. Publicly accessible AEDs are now commonplace in many European countries, and they are often found in sport centres, transportation hubs, and other public places. In Denmark, an online network owned by the foundation TrygFonden, contains detailed information about AED location and accessibility on all AEDs voluntarily registered in the network by AED owners. The Emergency Medical Dispatch Centres (EMD) across the country are linked to the network, enabling them to refer cardiac arrest witnesses to the nearest accessible AED. The network has provided a unique opportunity to assess the use and effects of public access defibrillation in Copenhagen. In this study, the authors determined: (1) the proportion of AEDs applied to out-of-hospital cardiac arrest (OHCA) victims before arrival of the ambulance; and (2) the proportion of AEDs referred to by the EMD. When the dispatcher at the EMD suspects a cardiac arrest, they are able, through the network, to refer the witness to/explain on the phone where the nearest accessible AED is. The research team also assessed 30-day survival and characteristics of OHCA-victims. The researchers identified a total of 521 patients with OHCA from the Mobile Emergency Care Unit and the Danish Cardiac Arrest Registry between 2011 and 2013. They obtained Electrocardiogram-downloads from all applied AEDs. Information regarding AED-referral by the EMD was obtained from the nationwide AED Network. An AED was applied to an OHCA-victim before ambulance arrival in 20/521 (3.8%) cases, and 13/521 (2.5%) OHCA-victims were defibrillated by an AED. To explain further: an AED was applied in 20 cases of cardiac arrest, but the AED only defibrillates (delivers one or more shocks) when it registers a “shockable rhythm”. In case of cardiac arrest, the heart either has some “electricity” left, which means the muscle is still working, but in an unsynchronised way, so that it can’t deliver blood to the rest of the body. In that case, a shock delivered by a defibrillator sort of “resets” the heart so it again beats synchronized. In other cases, the heart has an unshockable rhythm which means no electricity and it can’t be defibrillated by an AED, the only chance to get the heart beating is by performing chest compressions and hope that the heart will get some electricity so that it can be defibrillated. An AED only works when it can deliver a shock, and the data in this study showed that an AED was actually valuable in the 13 out of 20 cases where it was applied, underscoring their eligibility. Thirteen of the 20 people who had an AED applied had a shockable rhythm, and thus received one or more shocks from the AED. In six cases, the member of the public was guided to the AED by the dispatcher. The data showed that the 30-day survival for all patients, regardless of initial rhythm, was 50% for patients with an AED applied and 19% for patients without an AED applied. For OHCA with an initial shockable rhythm (meaning they could directly benefit from the applied AED) 30-day survival was 64% with an AED applied versus 47% without. They add that during recent years, Denmark has seen an increased use of AEDs, which might reflect several initiatives taken to raise survival after OHCA in Denmark including; implementation of mandatory resuscitation training in elementary schools and when acquiring a driver’s licence, improving the telephone guidance to bystanders witnessing a cardiac arrest, by using health care professionals to receive calls at the EMD, as nurses or experienced ambulance rescuers trained to recognise cardiac arrests and to guide the callers to perform chest compressions and use an AED until ambulance arrives. Bolton West MP Julie Hilling is backing the British Heart Foundation’s (BHF) push to make it compulsory for children to learn life-saving skills in school. The BHF’s Nation of Lifesavers campaign, which launched on March 16 2014, strives to ensure that all secondary school children are taught how to save a life with CPR and Public Access Defibrillator awareness. According to the BHF, over 30,000 cardiac arrests happen out of hospital every year and less than one in ten people survive. They are on a mission to create a nation of lifesavers within five years and help more people survive an out of hospital cardiac arrest. But it is the lifesavers who are the stars of this campaign. It is those heroes who inspired Ms Hilling to fight for that life-saving training to become mandatory. She said: “The inspirational stories of people that have saved lives have made me believe that this is so essential.